Holders DR Congo suffered a shock elimination by neighbours Congo Brazzaville on Saturday. Burkina Faso pulled off a shock 2-1 win over Ghana on Sunday to qualify for the 2018 African Nations Championship (CHAN) in Kenya, the tournament for home-based footballers. Elsewhere on Sunday, Namibia overturned a first-leg deficit against Comoros to progress. On a weekend of shocks, the holders Democratic Republic of Congo were eliminated on the away goals-ruling by neighbours Congo Brazzaville, as Mali, Algeria, Egypt and South Africa also suffered exits. Ghana, who drew the first leg 2-2, failed to make the most of home advantage in Kumasi, suffering defeat to Burkina Faso in front of their own fans. The hosts were rocked by Burkinabe goals from Mohammed Sylla and Herman Nikiema inside 30 minutes at the Baba Yaro Stadium. Felix Addo pulled one goal back for Ghana just before the hour, but could not find the second goal they desperately needed to force a penalty shootout. Burkina Faso qualified 4-3 on aggregate and will join 15 other countries at the biennial tournament, which Kenya will host from January 12 to February 4. Also on Sunday, Namibia secured a place for the first time after a second-half brace from Muna Katupose earned a 2-0 victory over Comoros in Windhoek. The substitute struck after 54 and 80 minutes as the Namibians overturned a 2-1 first leg loss. 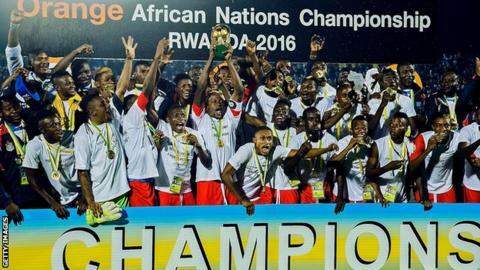 2018 hosts Kenya and Equatorial Guinea, who qualified after Gabon withdrew, will also be making maiden Nations Championship finals appearances.